We respect Our Earth and the treasures she yields by using sustainable, conflict-free and when possible, recycled materials! Our jewels are designed, carefully crafted by our hands locally in Los Angeles. Team up with us to collaborate on your very own "bespoke" one-of-a-kind custom design. ★Creation... always a work in progress ever evolving! Comes beautifully gift wrapped in new and reused materials. We offer PAYMENT/LAYAWAY PLANS - contact us to customize yours. We offer a 48 hour courtesy hold/reserve while you finalize your decision. After 48 hours, we will ask that you pay a deposit to continue holding the item. The deposit is non-refundable after 90 days. INTERNATIONAL orders are welcome. We accept Paypal and credit card payments through Etsy. Please note that we are NOT responsible for duty, tax or related shipping charges. 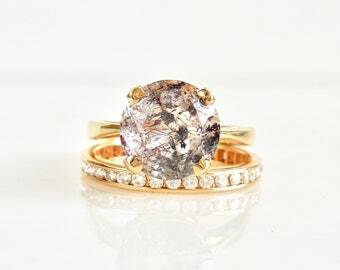 A little about our beloved "RUSTIC" diamonds ... so perfectly imperfect. Here at J E W E L L U X E, we embrace the imperfect showcasing their unique characteristics. ROSE CUT (or rosette) diamonds have been adorning jewelry since the middle of the 16th century. 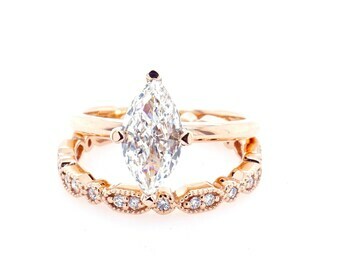 Their brilliance radiates from triangular facets forming a pattern radiating from the apex of the stone. Typically, the top of the stone is domed and the bottom is a flat polished surface. The total number of facets and arrangements vary. Diamond SLICES have recently emerged into the jewelry industry around 2010. Thin slices of diamonds are cut from included diamond rough. Unique patterns formed by inclusions (matrix) are showcased with this faceting style that reveals their decorative beauty. Faceting consists of a large, flat table with triangular facets on the outer edge and the bottom might be slightly faceted, flat and polished. The cutting style, size, shape, count, and placement vary. Thickness also varies and the thin slices are very fragile. Diamond slices are prized for their interesting matrix inclusions. RUSTIC diamonds range in color saturation and hues from white (clear), yellow, red, blue and all the different combinations available. Different trace elements naturally produce the colors or they can be treated to enhance or produce certain colors. Often you'll find a combination of hues, saturation and/or patterns that are unique, organic looking - naturally beautiful! 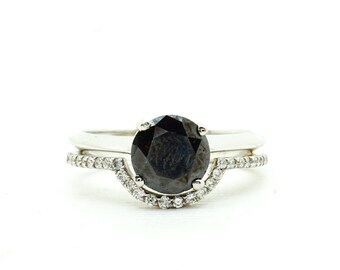 SALT & PEPPER - light colored diamonds that have eye visible black and/or white inclusions. When the light hits the inclusions they sparkle internally like our galaxy. The higher concentration of dark inclusions the darker the diamond appears. ICY - clear or whitish diamonds with visible internal inclusions that resemble the milky way or crushed ice. The surface sparkle is amazing and the internal brilliance depends on the transparency and cut. MILKY - white diamonds with strong fluorescence giving the diamonds an opalescence or a bluish hue. While diamonds are the hardest known substance to man, inclusions affect their durability. Absolutely beautiful ring. Would buy from seller again! So easy to work with and got to me in no time flat! Love it! Capturing the MAGIC of our Moonstone + Moissanite + Morganite Arc set. Coming soon ... a new selection of galaxy salt & pepper diamonds in our 6 prong solitaire. They look beautiful alone or surrounded by tiny sparkles. Our J E W E L L U X E style is a blend of many different elements and mediums that are tweaked until perfection. We use recycled, reclaimed metals such as gold, silver, platinum and palladium. 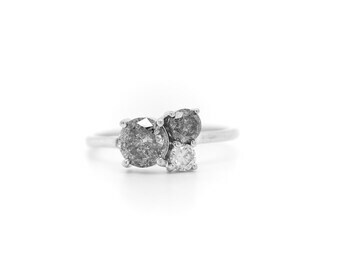 Our pieces are made with conflict-free, traditional and non-traditional diamonds or gemstones. 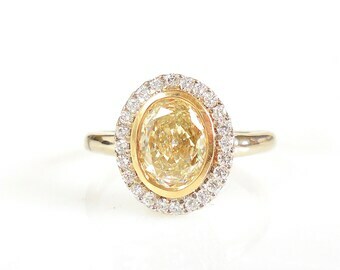 We use genuine gems and diamonds that are hand selected for their innate beauty. 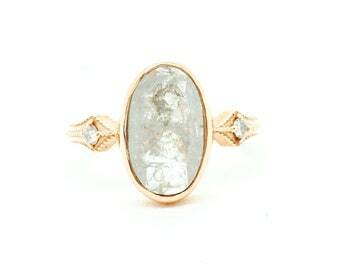 Featuring natural inclusions, we embrace them, showcasing their individual beauty. Hopefully, our imagination shines brightly for you! How often do you have the chance to have creative input? Here we collaborate with you to custom design that special, meaningful piece. It starts with an idea, an inspiration. We love it when you send us pictures/links or sketches with your ideas. We will help you create that special piece. Some projects are more complicated requiring more patience and time. There's something special JewelLUXE offers besides creativity. We strive to provide you with an excellent product, expert craftsmanship with exceptional service. We so understand that there are many choices, especially when it comes to jewelry. We sincerely appreciate that you've chosen us. Rest assured you are working with seasoned professionals who take personal pride in their work. What's N E W ? NEW - Jewelluxe.com come check us out! Our talented computer technician who translates our sketches into computer language into beautiful jewels. Very fortunate to be part of a loving company that is dedicated their craft. Gemstones and diamonds are the most exotic gifts from nature. Assisting in making timeless jewelry is a honor, I love knowing that till be passed down as a family heirloom. Moses, my master goldsmith with a creative/engineer brain, magically making beautiful from nothing. Andranik is our computer wax guy translating our ideas into computer lingo. We've been creating jewelry together for over 25 years. - I retain buyer information for our recording keeping purposes. We specialize in custom orders and work together with you to create/design your own piece. Once the design and estimate are approved, a deposit/payment is required to commence further work. When your order is ready, we will contact you and make a listing for the balance. If you wish to cancel your order after work has begun a restocking fee of 15% of the quoted price will be charged. Production time varies and is typically 2 - 4 weeks for completion. More complex pieces can take up to 6 weeks. Please contact for RUSH orders which may incur a RUSH charge. Our goal is to make your custom experience memorable! Please CONFIRM your sizing with your local Jeweler. 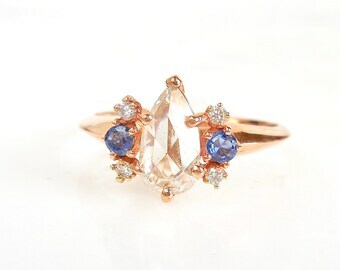 Ring sizing is tricky and you should try pieces on that are close to your desired piece in width, thickness and style. Remember when you stack rings they become tighter. We will gladly resize any ring you buy from us. Resizing charge starts from $65, which includes return insured shipping. Larger sizes may cost more. Please contact us before shipping the ring back and let us know the size needed. Include a note with your return with your name, shipping address, email address and size needed. Current processing time is 1-3 weeks. Resizing and shipping fees are not refundable. Some pieces are impossible to adjust but we will do our best to assist you. Jewelry is not indestructible, care should always be used while wearing it. To give your ring the care it deserves, we recommend not wearing your ring while: showering, washing dishes, cleaning, sleeping, exercising, gardening, or doing any other activity that may cause damage. Spray with glass cleaner ("Windex" ) directly on most jewels and scrub with a soft toothbrush or lint-free cloth. Rinse under cold water, repeat until clean. Pat dry with a lint-fee cloth. Or give your jewelry a quick cleaning by mixing together warm water and a few squirts of mild dishwashing liquid. Soak your ring for 5-10 minutes then brush gently with a soft toothbrush and rinse. Our jewels come packaged and ready to gift. If you'd like special gift wrapping just send us a message and we'll make sure your gift is wrapped with care. I offer a limited one year warranty against manufacturing defects in material or workmanship. I do not cover damage due to neglect or abuse. Loss, theft or damage of a main stone is not covered under our warranty. Contact your insurance agent about how to adequately insure your fine jewelry. Many of our clients purchase insurance coverage through Jeweler's Mutual. Lost side stones will be replaced at no charge or at cost for a one year period after purchase with normal wear and tear. Stones will shift when a piece is sized or damaged. Message us if your piece needs repair work with pictures of the damage. If another jeweler works on one of my pieces, this warranty will be voided.